The fundamental principle of The Red Cross lies in the concept of "Humanity" and in offering people unstinting help by freely approaching them in order to alleviate pain and suffering and to protect, support and nurse those people, regardless of their nationality, race, creed or social standing and without drawing any distinction between friend and foe. Furthermore, the expertise in nursing science enjoyed by The Red Cross of Japan compels us to undertake missions wherein we act in accordance with the systematic and methodical pursuit and practice of each of the Red Cross’s basic principles. The education in nursing science and practice which began in 1890 has produced many excellent leaders pioneering the field of nursing education and bearing the above principles in mind with the aim of establishing practices based thereon. To date, the nursing activities of The Red Cross have made a great contribution to the world at large, not only through disaster relief activities at home and abroad but also by expanding into the fields of healthcare, medical services and welfare. An indispensable aspect of our activities lies in furthering liaison by means of activities, education and research and in expanding the academic and scientific network in order to develop and promote these activities. We believe that we have the duty and obligation to pursue the tasks mentioned below the better to expand and augment Red Cross nursing activities in the 21st century. One expectation is to raise the academic level of nursing science as befits the concerns of human life and health. In other words, we must advance research in nursing science and further specializations after establishing a body of nursing science knowledge. It is necessary to create opportunities for the presentation of research and at the same time increase the scope for sharing widely knowledge and information with the promotion of nursing training and nursing science at university level and the enhancement of graduate schools and research institutes. 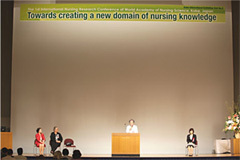 It is indispensable for those who are engaged in research to exchange and to share their knowledge and to create a common ground where all can work mutually in a rapidly changing environment in order to advance education and to pursue practical activities reflecting the knowledge and information gained through persevering research into cutting-edge nursing science. It is necessary to expand the research network to encompass the central educational institutions furthering nursing science, thus allowing participation in international activities, including those of the Red Cross. We established this society in order to garner and then share knowledge and information and engage in mutual criticism and discussion for the sake of tackling our commitments. 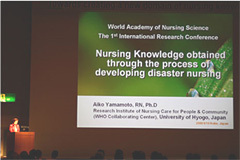 The Japan Red Cross Society of Nursing Science is to provide the basis for the scientific organization which will expand the nursing activities of the Red Cross of Japan. The education in nursing science and practice which began in 1890 has produced many excellent leaders pioneering the field of nursing education and making a great contribution to the world at large through disaster relief activities and welfare work at home and abroad. The principle of activities by The Red Cross lies in the establishing and expanding of the mutual understanding called "Humanity" founded on the common concept of mankind as humans transcending the social, cultural and value differences of each country. That is to say, the guiding principle of The Red Cross is to be found in offering help to people in need by approaching them in person, seeking to alleviate their pain and suffering, protecting, supporting and nursing while making no distinction between friends or foes. The Red Cross's appointed task is to educate and train nurses possessing sufficient knowledge and skills answering the needs of their times in order to pursue these tasks at any time and anywhere. 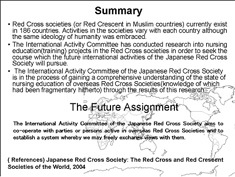 The Japan Red Cross Society of Nursing Science intends to strive for information exchange regarding nursing practice, education and research and will develop together with other Red Cross hospitals and educational organizations in Japan and throughout the world to prepare for the rapid and drastic changes in society both at home and abroad which the 21st century will experience, for instance, the medical problems which an aging population and a low birth rate will bring in their train. Allow me to express to the other members of this society my delight at your showing your manifest ability as nursing experts confronting changes both great and small changes thrown up in this era of reform. I regard it as the duty of this society to strive to uphold the aim of the development of The Red Cross Nursing, ever bearing in mind the concept of "Humanity", the underlying principle of the Red Cross Society, as that of The Japan Red Cross Society of Nursing Science . The number of societies of nursing science in Japan has passed 30 since the Japan Society of Nursing Science was inaugurated in 1890, which is very encouraging as a reflection of past and future results in the development of the science of nursing. 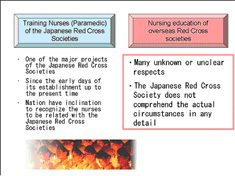 On the other hand, we need to assess how best to enhance our society's originality, and to that end we have set ourselves the task of finding the particular academic characteristics of The Japan Red Cross Society of Nursing Science within such academic fields as practice, education and research activities, communicating them to the society and overseeing their development. To further this practical activity, the "The Development Project for Clinical Nursing Practice was adopted. This is also the project of the Social Insurance Union Societies Related Nursing which was founded in 2005. Furthermore, we must consider tackling the task of international activities which could come to constitute the core of the Red Cross. We would like to invite your interest in and suggestions to this society as we, the officials, co-operate in striving to meet the expectations of the other members of this society. 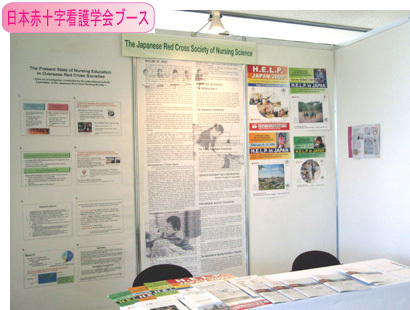 The Japanese Red Cross Society of Nursing Science has attained its 10th anniversary, and we can summarize the history of the Society's annual meetings, as follows. Themes and topics vary according to social changes. 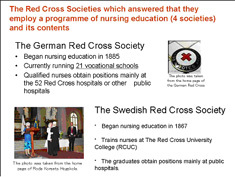 The members of the Society find it important to link education on the Red Cross to nursing practice, but the relationship between the Red Cross principles and nursing practice has not been fully explained. We can expect that Red Cross international operations continue to develop, keeping their unique character. The Research Committee organizes not only thematic sessions but also workshops in annual meetings, in order to improve the quality of research. We organized new committees, namely the Committee for the Development Project of Clinical Nursing Practice in 2006, the International Activity Committee in 2007 and the Committee on Nursing Activities in Disasters in 2008. These committees have undertaken activities in their respective fields, and held thematic sessions in annual meetings. We now find it important to undertake the following steps to contribute to raise the level of nursing. It is time to focus, at our academic activities, on interaction between those who undertake nursing practice and research, and to collect research outcomes. We have to discuss how the Red Cross principles have been applied to nursing practice in order to improve the education of Red Cross nurses. 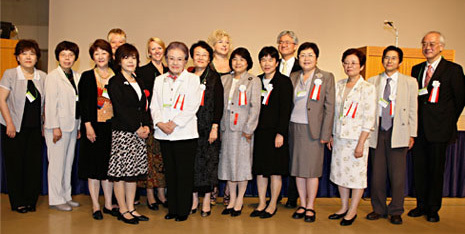 The Editorial Board edits and publishes the Journal of the Japanese Red Cross Society of Nursing Science. The role of the journal is to provide a forum where members can publish the results of their daily activities and to better nursing practice and research. In particular, many of this Society's members are practicing nursing, and they make use of the journal to reflect on their nursing practice. The journal contributes to linking present nursing practice to future practice. To this end, the Editorial Board would like to publish articles on the nursing practice of high quality which reflects on nursing practice. The role of the Research Committee is to assist research activities in clinical nursing and to offer financial assistance. The Committee plans a seminar on nursing research once a year so that the Committee may assist research activities in clinical nursing. For three years beginning in 2007, the Committee invites Associate Professor Motoko Kita of the Tokyo Healthcare University to explain problems of qualitative research for beginners in research.
" Let's start qualitative research!" "How to write a proposal of qualitative research." "Data analysis of qualitative research with particular emphasis on the grounded theory approach." Furthermore, our society has been subsidising research concerned with nursing practice since 2004. The annual subsidy is 600,000 yen and we stipulate an upper limit of 300,000 yen for each piece of research. Thus we subsidised two research undertakings in 2007. 1. publishing newsletters and 2. administering the homepage of a web site. The newsletters are issued for the purpose of disseminating information about this society and to exchange further information such as the purveying of members'opinions and feelings. Although our newsletter is published but once a year, we can nevertheless include important information because we focus on promptness in publishing information and in the inclusion of research articles. 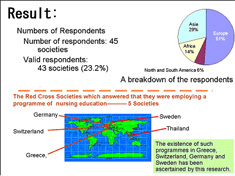 We administer the web site on the basis of informing as wide an audience as possible of the activities of the Japan Red Cross Society of Nursing Science and contributing to promoting the services of the members of this society. "Committee for the Development Project of Clinical Nursing Practice"
This committee is functioning under another name, i.e. the committee for the passing on of nursing techniques . This committee searches out Red Cross nursing techniques which have been cultivated for a long time and collects the relevant information with a view to verifying the practice, effect and evidence of these techniques from the people taking an active part in the clinical field. Please report or notify the committee of any technique employed in daily life in the course of your work in nursing care and which you would like to share with others, e.g. on a senior nurse to junior nurse basis. Kindly make use of the notice board with the heading " Nursing Techniques We Wish to Pass On"
The globalisation characteristic of recent years has led to a demand for international co-operation in all fields, not least among them are the requirements demanded of the year- by-year activities of societies of the science of nursing. 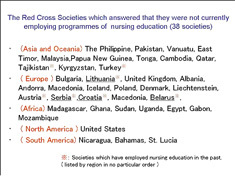 The number of societies of nursing science has passed 30; all have been pursuing activities involving international co-operation. 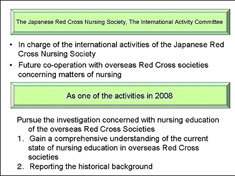 The Red Cross of Japan possesses an international or indeed a global aspect in terms of its history and accordingly its nursing activities have been conducted worldwide. Our work in international co-operation serves to enhance our society's unique position amongst organizations devoted to nursing science. 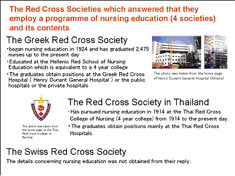 This committee aims at co-operating in the international activities of The Red Cross which have actively carried out up to now, by supporting academic expansion and by sharing the tasks involved in international activities in co-operation with the nurses' educational institutions of The Red Cross in other countries. Also, we will seek to expand our society's role in carrying out the international activities while maintaining ties with other academic societies within this country. We have introduced a system for collecting information concerned with the overseas activities of the Red Cross whereby personnel who have been abroad may report on their accomplishments to nurses and student nurses. We wish to receive any information connected with international nursing activities and opinions, suggestions or requests from you. 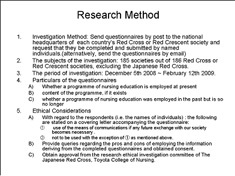 Copyrightc2003-2005 Japanese Red Cross Society of Nursing Science. All Rights Reserved.